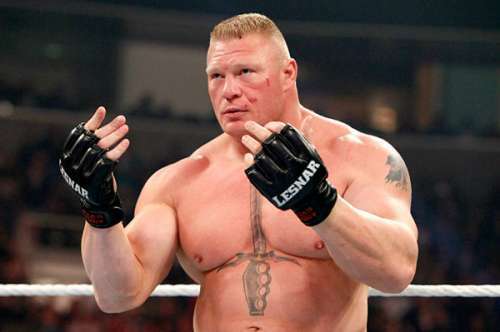 Brock Lesnar vs Braun Strowman booking for WWE SummerSlam 2016? One or four, doesn’t matter! If you are one of the many kicking or throwing stuff because of the short-lived Brock Lesnar-Wyatts feud, reading this will raise your spirits. The word backstage is that the WWE brass are toying with the idea of the Beast Incarnate going head to head with Braun Strowman. And what’s more, it is rumoured that the Black Sheep of the Wyatts might defeat Lesnar to be out over as the company’s monster heel. And while many may attribute this to Strowman reportedly being Vince McMahon’s pet project, we hear that other executives as well have high hopes for the former rosebud, according to dailywrestlingnews.com. There are reports of the feud being reintroduced later this year. The program with Lesnar and the Wyatts, when ignited, was the buzzword on the WWE Universe’s lips, a mouth-watering showdown that had many clutching their seats in excitement. After a promising start, it was shut down without warning and replaced by the Lesnar-Ambrose feud we now know will culminate at WrestleMania 32 in a No Holds Barred Streetfight. Both Lesnar and Bray Wyatt were disappointed to say the least, as they were looking forward to a singles match a WrestleMania 32. Now that that’s precluded, the WWE Universe will have to sate itself with their one-on-one contest at the live event in Toronto on March 12th, WWE Roadblock. What if Brock Lesnar had really left WWE after SummerSlam 2018?